Lately I have not posted many of my own recipes. There are so many great recipes out there I figure, why recreate the wheel? I’m perfectly happy making others creations and reporting back on the outcome. This recipe, however, is our own creation and is one of my favorite dinners. I think we came up with the idea back when I was on a dairy-free diet while nursing our son. 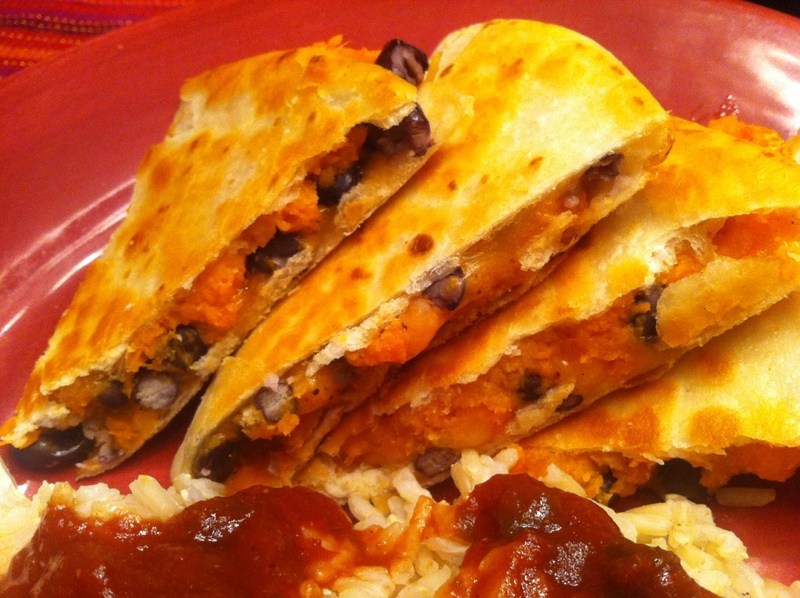 The addition of sweet potatoes makes the quesadillas creamy in the middle so that you don’t even miss the cheese. It also helps hold everything together like cheese normally would, so your quesadilla doesn’t fall apart. Peel and chop the sweet potato into one inch chunks. Boil about 20 minutes or until fork tender. Drain. From here you can either mash the entire batch or leave them in chunks and only mash the ones you need. We leave some in chunks because our son usually eats the leftovers that way. Preheat 2-4 tbsp oil in a skillet over medium heat. On half a tortilla spread some mashed sweet potato. Add black beans and cheese. Sprinkle with desired spices. Fold the other side over and then cook in the heated skillet about 4 minutes until browned. Flip and cook the other side until browned. On a cutting board cut into 3-4 triangles with a pizza cutter. Add oil as needed to the pan as you cook the rest of the quesadillas. We served these with a side of what I call “salsa rice”. Which is simply cooked brown rice with salsa on top. I also have some plain Greek yogurt on the side for dipping. I love quesadillas cooked in oil because the outside gets nice and crispy. But I’ll admit, it’s not the healthiest option. You can also lightly butter the outside of the tortillas and cook without oil. With the butter on the outside it might be hard to handle folded over. So try making a full quesadilla out of two tortillas and then cut into 8 triangles for two people. We usually cook 4 quesadillas with this recipe and always have extra sweet potatoes and black beans left over. I think you could easily make six if desired. I always ask Benzo to make me an extra one to take in my lunch the next day. 🙂 I think I could eat this dinner once a week and never get tired of it! Just last night I made beans quesadilla for my neighbors’ children who were over for a while. Great healthy,tasty and Home made. way to go. Quesadilla in various iterations (chicken, veggie, bean) are on regular rotation in our house. We cook them open in our iron skillet (no butter, no oil) and they still get nice and crispy (though, we use corn tortillas, so I don’t know if that makes a difference). When it’s done, we just fold it in half and it’s good to go. Good to know you can cook them dry! I never really tried it before. 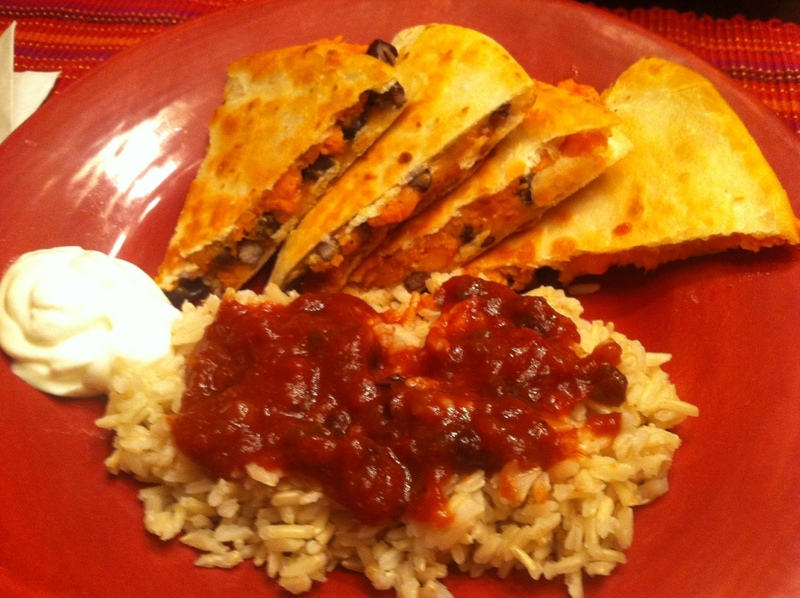 Quesadillas seem like such a good food for kids. Maybe it’s the fun triangle shape? These look like they are so good and easy to make. I will definitely have to try them. If your looking for a great beer to go with these then follow my blog for the best recommendations. Instead of boiling the sweet potatoes, which can sometimes be stringy, you can also steam it in chunks. It retains less water than boiled and it mashes up nice, never stringy. On a side note, you could probably substitute pumpkin for sweet potatoes, also steaming (which also doesn’t retain the water of boiling or the stringiness of baking). Fair warning, once you start steaming your own pumpkin and sweet potatoes for pies and breads, your kiddos won’t let you go back to the canned stuff. They can tell the difference in the richness and freshness, especially with pies.